If playing music is one's real passion, even major life decisions – such as emigration to another country – can't stop them from pursuing it. In fact, it can even open up a brand new door for them and make them start anew, just as in the case of the Coventry-based Rock/Metal ensemble Soulride, comprised in its entirety of Polish immigrants. 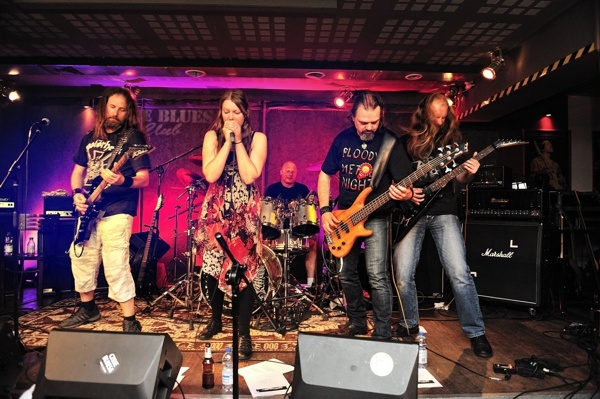 On the eve of the group's UK tour alongside the Polish classic Heavy Metal band CETI, scheduled for late February, Alexandra Mrozowska caught up with the band's bass player Tomasz Belcarz, guitar player Adam Wroniak and singer Kamila Schmidt to find out more about Soulride. Soulride is a Coventry-based band, its line-up comprised of Polish musicians who emigrated to the UK. What were the circumstances of founding the band? Tomasz Belcarz: Soulride was founded on the 15th of November 2008. That rainy, autumn evening I invited two of my guitarist friends, Adam and Pawel, to my house. We had one goal – to form a band and rush to conquer the British stages. Our future singer was also with us, yet the line-up remained incomplete as we didn't have a drummer at the time. Despite this, after drinking a few beers, drinks and I can't remember what else, we went to the Polish Community Centre. After the concert we caught up with the club's owner and convinced him that our newly formed band will perform a gig on that stage in three months... a show that will be remembered for a long time. When he asked us if we're able to prepare everything in time, we all said almost in unison what would become our band's motto: "What? Who says we won't be able to do it?" Of course, we did manage to do it. Each of us had some experience with playing music in Poland and we all wanted to get back to playing music. Not everyone understands our situation in the UK – we're immigrants from Poland. Plenty of Poles arrived in the UK since our country joined the EU and we formed kind of our own little nation. The stage of integration with the British music scene was still ahead of us. At that moment, we wanted to play Polish music with Polish lyrics for the Polish audience. Only later we translated the lyrics to our songs into the language of Shakespeare, but that's a different topic. During the preparations for the aforesaid gig our line-up changed a bit. Our vocalist left and his responsibilities were taken over by Pawel. The drummer Tomek joined the band only to be replaced with Marcin a year later. However, we did what we wanted and on the 21st of February 2009 we played a concert people still remember. You define your sound as somewhere between Rock and Metal. What are the respective band members' influences and how do you think they contribute to the overall sound of Soulride? Adam Wroniak: When our band first started, we gravitated more towards Rock music. However, this was related to some technical limitations of the respective band members. A year later and after some changes to the band's line-up, the music also began to change. Our first EP. 'Lost'. was still Rock, but back then we already knew we wanted our sound to be heavier. Our second EP was released in 2011 and was more Metal, introducing the sound we're interested in. Back then, we had plans of recording our first full-length album but in 2012 our singer Pawel left, and a few weeks later the band went on hiatus. In 2014 we relaunched the band but until mid-2017 we'd played just a few concerts. Since September 2017, with the addition of a new guitar player to the line-up, we started working on the new material. Each of us has lots of experience with Heavy Metal, but we all draw inspiration from other sources too. For example, Kamila like everything labelled Rock/Metal/Progressive, while Tomek is a huge fan or Hard Rock. So, we meet and mix ideas, and Soulride is what comes out. What do you think has been the biggest achievement for Soulride so far? Are you happy with the direction the band is heading towards now? T.B: Even though almost ten years have passed since Soulride was founded, we believe our biggest achievements are still ahead of us. So far, we have played lots of concerts in England and one in Poland. We also recorded two EPs. In 2011 we were invited to London to headline the 19th Final of The Great Orchestra of Christmas Charity (Wielka Orkiestra Swiatecznej Pomocy). It was a huge honour for us, showing us real appreciation of the Polish audience in England. It was our biggest concert so far. As for The Great Orchestra of Christmas Charity, all Poles know what it is – but for those Rocktopia readers who might need an explanation, it's one of the biggest charities in the world supported by Rock musicians. Each year, on the 2nd Sunday of January, a majority of musicians from our homeland play concerts for charity, most often for ill children or elderly people. For me, it was an amazing experience and I'm glad I was a part of it. With your previous experience as musicians earned in your homeland Poland, what do you think is the difference between Poland and the UK as far as the various aspects of playing in a band (like technical, logistic, financial and promotional issues) are concerned? A.W: In Poland I played in a few different bands, and when it comes to bands of similar status to Soulride, things are similar. You have to invest money into lots of equipment and transport. Clubs are very eager to organize concerts however you have to "buy" the stage and then take care of promotion yourself. So if people come to the concert, you'll earn the money to buy some new strings [laughs]. How does the audience in the UK differ from the Polish audience? A.W: The audience is very similar. They come to the concert, listen to it, drink some beer and some of them come over after the concert to chat or take pictures. T.B: Fans of Metal around the world are all similar. They come to the concert to listen to some music, to go a little crazy, to drink, and to meet other fans. Any differences, if they exist at all, most likely come from a different mentality of the specific community and national traits. The audience in Poland reacts very spontaneously – the biggest fans and maniacs in the front of the stage. In Poland the space in front of the stage has to be fought for. If you leave it, you won't get back to your previous spot unless you decide to fight for it again. That's one of the differences I've noticed when I started going to concerts in England. Here elbows also often go into action, but it's pretty calm in comparison. That's of course my own subjective opinion and I have to add that I like watching a concert close to the stage. When standing on stage, you can't really see these differences. You just have to do your very best. If you fake, people will notice it. Soulride is one of at least a few Polish bands in the UK scene. Any names you'd like to recommend to those of our readers who might not be that familiar with them? T.B: Soulride was one of the first Polish bands created in the UK and one of the few where all members of are Polish. And it's still the same today. We play together in a band, yet we're still primarily a group of friends who like spending time together, partying, joking around, drinking and sobering. I observe bands I'm in touch with that include Polish musicians in them – and I have to say that bands with a mixed Polish-English line-up, or with musicians from other parts of the world, work together well and inspire each other with different music tastes. However, rarely does it happen that there's anything beyond music that's able to bring these guys together. Both approaches have their pros and cons. Coming back to the question, most of the bands we met in these past years have disbanded in different circumstances. Our current singer Kamila used to sing in a very interesting band Awaker, the members of which sadly went their separate ways some time ago. In London, there's the band Metasoma – an international band with two Polish guitarists as leaders. We played a few times with the Bristol-based band Bonemud, a very interesting one with a really good album under the belt... however, from what I've heard, they also have some problems with the line-up these days, and seem to be on hiatus. Our guitarist Adam played for almost a year with a popular local band from Birmingham, Chemikill – a band that also included a Polish drummer for a while. There's a lot of Polish bands and Polish influences on the English music scene. It's hard to name them all. Do you think the British media are open to non-native acts as far as promotion is concerned? Kamila Schmidt: Absolutely! Especially if we're talking about the world of Metal. This is a specific music genre expressed primarily through riffs and drumming. Vocals are important too but for many, lyrics are in the background so it doesn't matter which language you're singing in or if you have a strong accent for example. Basically, good Metal is good Metal. A country which started it all, Britain is still full of Metalheads. Well-promoted non-native bands' gigs will be well-attended. This year, in February, you're going to play three gigs around England – in Birmingham, St Albans and Manchester – supporting CETI. In what circumstances did you hook up with the band? A.W: The circumstances were very interesting. In June 2017, our bass player Tomek was celebrating his 50th birthday. On that occasion we organised a concert in our homeland, in the city of Szczecin. We invited many bands which Tomek played in or is friends with, and of course Soulride. Along with the singer/bass player Skaya from the band Quo Vadis, who also played at the concert, we came up with the idea of inviting someone special. We decided to invite the legendary Polish Heavy Metal singer Grzegorz Kupczyk (CETI, ex-Turbo). Skaya contacted him, arranged all the details, and so he came to the party to sing a special version of his 1982 hit single with Turbo, 'Dorosłe Dzieci', with Quo Vadis and me. After the concert, I talked a bit with Grzegorz and we came up with the idea to organise a few concerts in England for our bands. A few weeks later, we found out that our good friend Izabela Kostrzewa had become CETI's new manager. Together wih Tomek, I visited clubs all over England to finally choose those in Birmingham, St.Albans, and Manchester. Our friend and the guitar player of Black Birds Theatre Mariusz Kabelis also helped us out with this. We know that if we're organising a string of gigs and CETI is to be the headliner, we'll be supporting them. T.B: Yes, we won't forget that evening. The guys kept it a secret to the very end that they invited Grzegorz to perform. It was a huge surprise and a great honour when Skaya announced him on the stage. And it was a great surprise for the audience too. To this day I don't understand how came up with it and made it happen. It was a great gift. After the concert we talked with Grzegorz, and that's how the idea of the UK tour started. Are you looking forward to sharing the stage with them? What do you think the audience who's going to attend any of the three UK gigs should expect? A.W. : We know that CETI is a very experienced band with great musicians in their line-up, so playing with them will be a great challenge for us and we're going to gain a lot of experience. I know their approach to every concert is very professional, so the gigs will be very successful. They even prepared some special T-shirts for the concerts in the UK. So we have to do all that's possible to make sure the concerts are of the highest quality. The audience can expect three really good concerts. Could you please tell something more about the local bands who will perform with CETI and Soulride on the scheduled dates – Whisky, Black Birds Theatre and Terralith? T.B: Whisky is your typical tribute band. They perform songs by the band Dzem, which is very popular among the Polish audience. Its Polish Blues Rock sound completely different from Blues or Blues Rock known elsewhere in the world, making them a great band to see. I had the honour of creating this band and performing with them in the first few months of its existence. We're friends to this day and they're from Birmingham, so that's why they were the first band I invited to take part in these concerts. Black Birds Theatre is a band led by our friend Mariusz Kabelis, with whom we organised this tour. They were the support for Quo Vadis in 2016 during their concert in St. Albans. I saw them that night and I have to say that I highly recommend seeing them. When it comes to Terralith, it's the only band out of three I haven't seen yet and I'm very curious about them in a live setting. The guitarist is Lukasz Michniewski, a former guitar player of Soulride, and also the leader of the afore-mentioned Awaker. Beyond CETI's upcoming UK tour, there are also other music events you're organising. T.B: Together with Adam and Mariusz Kabelis we have created Burn Rock Promotion. We have just one goal – to organise and promote UK concerts performed by bands from Poland. In the past, we've already organised a few concerts and tours for bands we invited, including Quo Vadis and Pandemonium. We also don't limit ourselves to Rock music only. In May 2017, a famous bard from Szczecin Sebastian Gorski played in Coventry, playing songs of Włodzimierz Wysocki as well as his own. We're trying to organise a similar event again, this time with all of the members of his band – Pan Gorski i Spolka. A man does not live just for Metal, and fans of sung poetry will be satisfied – although I think it may be more interesting to the Polish audience than British. But of course, we won't forget about the maniacs of Metal. In September, Quo Vadis will visit the British Isles once again. Right now, we have two concert dates confirmed, one in Birmingham, and another one in Northampton. These will be concerts to celebrate the 10th anniversary of Soulride and everyone is invited to attend. When it comes to other suggestions, it is too early to talk about that. The only thing I can say is that there will be a few surprises. This year you plan to record new material. What can be expected from it music-wise? A.W: With this line-up, everything's going in the right direction. After two EPs and a very long break, we finally have a band that's ready to make an album. We already have some material, and we will surely record some of our older songs which we play at concerts, only slightly refreshed. You'll be able to hear different sides of Soulride as there will be Hard Rock, Metal, clear vocals and growling. It will definitely be interesting. Is there anything else the band is up to these days? T.B. : Soon we're playing a concert at Metal2Masses. It will be the first concert of our new guitarist, Piotr "Kazik" Kazimierski. We'll also play new songs, written by the new line-up, and present the new Soulride logo. I can also add that this will be the first concert I'll play my new bass guitar which I recently bought. It impressed me the second I picked it up – it's beautiful, comfortable, and sounds amazing. I won't give away the brand just yet – those interested can come to the concert and see for themselves. I know that my friends are also preparing a few surprises in terms of equipment and more. Apart from that, we're already focused on the tour with CETI. It starts in Birmingham in the club Route44, a spot where we haven't played yet. So, February will be full of new experiences. T.B. This year will be very interesting for us, and also full of work to do. We'll play lots of concerts which we invite everyone to. We are sending our best regards to fans of all types of Metal in England, Poland, and all the other corners of the world where our music reaches.